Amsterdam, Netherlands - October 16, 2018 – Universal Avionics (UA) announces the completion of Authorized Dealer, Heli-One's Sikorsky S-76 VVIP helicopter flight deck upgrade. The avionics upgrade replaces legacy Electronic Flight Instrument Systems (EFIS) with three UA EFI-890H Advanced Flight Displays. The system also includes a new UA UNS-1Lw Flight Management System (FMS) with Vision-1™ Synthetic Vision System. "Legacy helicopters have needed these upgrades for some time, but the options for doing so have been limited until now," said Grady Dees, UA Director of Technical Sales. "Obsolescence and difficulty in supporting electromechanical displays, as well as some mandates, are driving the upgrade market, as are the costs of upgrading a helicopter vs purchasing a new one," he added. "There is still a lot of life left in these machines, and Heli-One's experienced and capable team of avionics designers recognize the capabilities to support them. 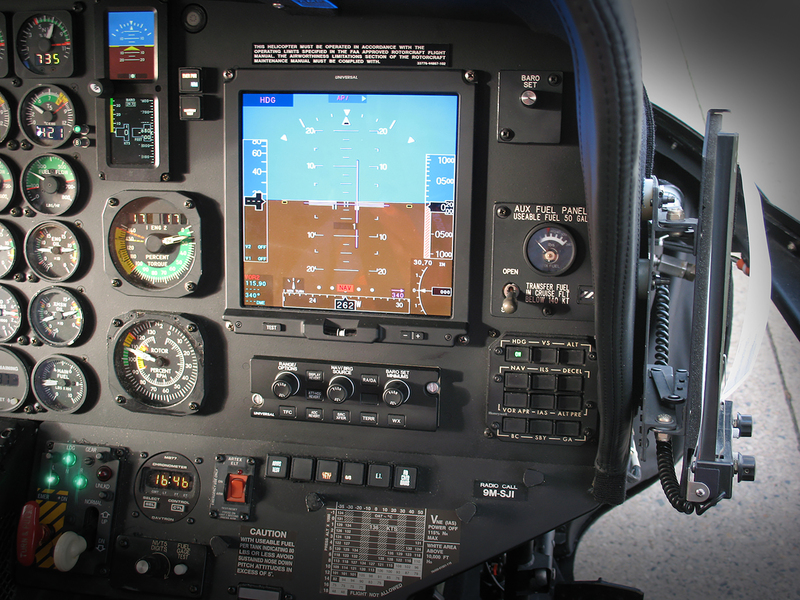 Paired with our products that are designed to seamlessly retrofit onto legacy aircraft, Heli-One and Universal Avionics can offer cost-effective, reliable upgrade solutions." "We are honored to complete this aircraft upgrade for our VVIP customer," said Eddie Lane, President, Heli-One. "Our entire team is privileged to work on this aircraft and we are certain the customer and flight crew will enjoy the modernized flight display and management system," he added. "The upgrade features the latest in aviation technology to facilitate a truly first-class flight experience."